Ericsson (NASDAQ: ERIC) today releases the latest edition of Microwave Towards 2020, an ongoing report series on the state of the microwave business. In the report, Ericsson predicts several major developments by 2020. Firstly, microwave technology will support multi-gigabit (Gb) capacities in traditional frequency bands and beyond 10 Gb in the millimeter wave (E and V bands). E band spectrum will be key in catering for capacity increases in backhaul as well as fronthaul. In addition, microwave planning will begin to include multiband use. In the coming years, the choice between fiber and microwave in backhaul networks will not be about capacity, but fiber presence and TCO. 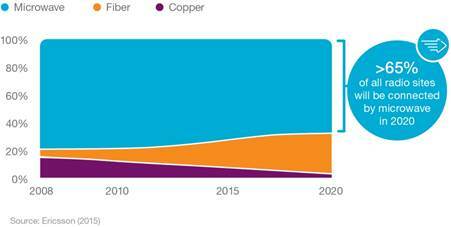 Ericsson foresees that microwave will continue to be the dominant backhaul technology. In 2020, 65 percent of all cell sites will be connected by microwave solutions; markets such as China, Japan, South Korea and Taiwan that have existing deep fiber investments will be the exception. Microwave backhaul technology is already able to handle 100 percent of all radio access sites' capacity needs, both now and in the future. By 2020, the technology will have evolved to support multi-Gb capacities in traditional frequency bands and beyond 10 Gb in the millimeter wave. Karolina Wikander, Head of Microwave, Ericsson, says: "Microwave networks are a vital ingredient for operators to provide the best possible performance and quality of experience in the most cost-efficient way, and will continue to be the dominant backhaul technology in the future. "Capacity needs will continue to increase on the road to 5G, and keeping up requires continued technology evolution and re-imagining network efficiency." E band spectrum will prove key in catering for capacity increases in both fronthaul and backhaul. The E band (70/80GHz) will experience major growth and will represent up to 20 percent of new deployments in 2020. Traditional bands will represent 70 percent of new deployments in 2020. Ericsson foresees a paradigm shift in microwave planning, with the introduction of multiband use. A seven-time capacity increase can be achieved using a wide, low-availability link in the E band to boost a high-availability link in traditional bands. Get more insights - including the pitfalls of the "pizza box" deployment approach and how to save three times the indoor space - in the September 2015 edition of Ericsson's Microwave Towards 2020 report.